A good home office helps you to focus and to enjoy your work. How your home office's workstation is configured will impact your productivity. By optimizing your workstation with the unique configuration that suits you best, you will not only externally accomplish more in a typical day, your internal feelings of personal accomplishment also increase. take the seat by the door, thereby making myself more available to family and visitors? Optimizing the floor plan of your workstation with Feng Shui principles can improve your own personal efficiency. Feng Shui is a philosophy in how energy flows in home design to facilitate good health and well-being. You, too, might be wondering, where is the best place to put my desk? According to the principles of Feng Shui, the workstation in your home office should be in the power position of facing the door, because it positions you for opportunity and service. Some home offices work better when the desk is placed diagonally. However, there is one more important factor to consider when devising your floor plan: eye strain. If there is a large bright window directly behind you, and you work on a computer much of the time, the glare could drive you bananas! Therefore, my answer is this: arrange your desk to face the door, unless there’s too much light on your computer screen, in which case, you may want to modify the positioning a bit (desks that come diagonally from a wall are perfectly okay – see photo above) or find a glare-reducer for your monitor. The main thing, as always, is to find a floor plan that works for you uniquely. Sometimes, unusual solutions are best. For example, my spouse and I share a large standing desk in our kitchen, that faces out into the living room (and the room’s entrance, therefore it’s in the “power position”). Odd, perhaps, but it works fantastically well. Your workstation is the hub of productivity – it’s where you make the magic happen. However, this isn’t 1962, and that means we’re no longer bound to a standard desk in order to do our work. Technology makes it possible to work in several key areas – the home, the office, the cafe, a parked car: you name it. It’s essential that you re-think your concept of what a “desk” actually is. I strongly encourage you to take advantage of technological advances and try to office outdoors for a little bit each day. The fresh air is good for your body, and change of venue can improve your productivity. Take your laptop, your phone, your e-Reader with you – whatever mobile tools you need to keep your work flowing. All you need is a nice spot outside in the shade. Humans need fresh air and a change of scenery every now and then. “Where do I put my desk?” …it’s such a great question, and I love it when readers understand that small changes can have a cumulative impact on profoundly improving our personal productivity. Need extra inspiration to be consistent with your new lifestyle habits? Become better organized by subscribing to our Quality of Life newsletter. Each week you’ll receive a simple lifestyle strategy that will inspire you to make better use of your time and energy. Get the FREE report instantly! Although many of us experience this modern 21st-century life as fast-paced, have you ever paused to consider how much you time you actually spend sitting down? Driving, office work, watching TV – it all adds up, and the more you sit, the more detrimental it is to your health. Sitting more than six hours a day makes you 40% likelier to die within 15 years compared to someone who sits less than three hours a day. That’s right: sitting shortens your life. Standing desks are better for your life than sitting desks. So it’s settled then. Not to be too dramatic, but the chair is a four-legged grim reaper. Okay, that’s pretty dramatic, but don’t worry, it doesn’t have to be this way. You just have to rethink the way you work at a computer. Standing not only helps your spine and increases your physical energy, it also improves your productivity. Many are beginning to realize the effects of sitting all day and the interest in stand-up desks has increased. There is now a selection of tall desks – as simple as a table with taller legs or as futuristic as an electronic height-adjustable desk (with the dual-function of a sit down desk and stand up desk). Don’t be daunted at the prospect of spending 8 hours a day standing at a desk. Standing all day isn’t that good for you either. You just need to strike a balance between the two by making a few adjustments and finding a schedule that works for you. I like to spend 1.5 hours standing followed by 1.5 hours sitting, and then repeat. As you build your strength, you’ll be happy to spend more time on your feet. You get used to it. If your workplace doesn’t offer a stand up desk be sure to break up your sit down time. If you have a desk job, you may have thought you’d escaped occupational hazards usually associated with working outside, but manual labor has its health benefits; namely: standing. Good ideas for an interruption are: stretching, walking in place, jogging on the spot or jumping jacks. Walking burns 3 to 5 times the amount of calories than sitting, so take every opportunity to walk around the office. Avoid calling or emailing your colleague and walk to their workstation instead. You can always limit the amount of time you sit at home. The less you sit at your own computer or in front of the TV, the less impact your sitting at the office will have on your health. Remember, getting 30 minutes of exercise a day is not enough to fight off all the damage sitting does. The only way to do that is to cut down the amount of time you sit at your desk. If you’re going to sit, make sure to recline your chair to a 135 degree angle. We have all been trained to sit forward or up straight from years of nagging by our school teachers but this is not right or healthy. It actually puts too much strain on your back. It will take at least a week to get used to your standing desk so be sure to rotate positions when tired, and have a foot rest in front of you to give each foot a break every now and then. An organized person has a calmer mind and a better day ahead. We open our eyes first-thing in the morning with the best of intentions. “Today is the day that I pull my act together,” we say. Or, “I’m going to get a lot done today and use my time super-efficiently.” But then the day just seems to get away from us, and – in the end – we were only able to accomplish a fraction of what we had hoped. The productivity zone is a place that organized people inhabit that feels happy, effective, and prosperous. Improved self-care requires time from your schedule. I find it irksome when experts insinuate that you can have everything you hope for, with no cost or effort. While improved health is easier than most people think, it’s still not instantaneous and effortless. Many people work full-time (some even have two jobs), raise their children, run their errands, do their household chores, walk their dogs, and much more — all in the course of one single day. On top of that, they also hope to: spend quality time with their spouse, meditate, exercise, read, and tend to their physical health and personal enrichment. Even retired people, or single people without children or pets, find it challenging to get-it-all-done. It’s not often easy to do everything that you’re supposed to do each day, let alone to do it in a way that is relaxed and enjoyable. The bad news is: modern life often makes it impossible to get everything done each day. The good news is: it is usually possible to get everything done within a week. How can you get everything done in one week, every week? The answer is: by consistently experimenting with organizational systems – tailoring them and improving them to meet your unique needs and circumstances. First, what is required is an attitude-shift about checklists. People have conflicted relationships with their to-do lists. They rebel against them, or, they have pangs of low self-esteem when they’re not able to cross those items off the list fast enough. They create lists, only to immediately feel oppressed by them. I invite you to begin seeing lists differently. Look at lists with a playful attitude. Engage your sense of humor. Lists are not trying to boss you around or shame you, they’re simply tools you created to help make your life clearer. Keep your Quotidian List in the place where you can access it easily and where you’re most likely to use it. You can also keep it digitally on your phone. I keep mine on Google Drive but I also print up a fresh copy each Monday morning. Next: craft your quotidian. Your quotidian is what will be, effectively, your daily checklist. Think of it as a your daily rituals of blessing. After all, our lives are mostly comprised of our little everyday habits and tasks. The big “Oscar moments” are there in our lives to provide texture and to symbolize new directions in our journey, but, in the end: life is mostly just the little things we do each day. We might as well do them reverently. For example, you probably won’t put “brush my teeth” on your quotidian, because you don’t forget to do that (you’ve been doing it so long that, by now, it’s already built into your muscle-memory). You can see above an example of my own quotidian; of course, yours will look completely different. See your quotidian as a living/breathing, organic entity that you’re in-relationship-with. That means that you’re always tinkering with it. Your quotidian is always evolving because you are always evolving. I keep my quotidian taped to a kitchen cupboard (I hide my favorite pen just inside that cupboard so it’s always there) and on Sunday nights I make any improvements to it that I want to make, then print up a fresh page for the next week. I’ve been doing this for many, many years and my personal productivity has gone through-the-roof. Action Step: begin to craft your own quotidian. Note: if you happen to be a tech-person and want to use an app or digital checklist instead of paper, go for it. Each person’s list and method is different. Even though I use technology and gadgets for nearly everything, for my quotidian I print it up on paper and tape it on the cupboard. I guess I derive deep, personal satisfaction from the physical act of checking each box. Don’t fret. There are two significant benefits to organizing your typical day. I’m going to tell you what they are, with the hope of inspiring you. I encourage you to seek out inspirational autobiographies or biographies in which highly productive people reveal their secrets for staying organized, that can really empower you to begin a mental de-cluttering process that can improve your life in remarkable ways. When you’re organized you don’t waste money buying stuff that you already own, but can’t find. I’m a big believer that when you get serious about The Universe, The Universe gets serious about you. When you’re organized, you’re better able to recognize and seize opportunities when they present themselves. Organized people are prone to succeed in their careers. There are few things that bring peace of mind like being organized. You have more time to spend with your loved-ones and cherished relationships, and what is more: that time you spend together is of a higher quality because you are less frazzled, with more peace of mind and more physical energy. There are so many ways that we humans use to deal with our anxieties of living in the modern age. We drink wine, watch television, eat potato chips, or smoke cigarettes – these are all just methods of self-medication, to smooth-out life’s rough edges and frayed nerves. Getting organized is also a way to deal with anxiety. But it’s a much healthier way. Do you believe that an organized person has a calmer mind and a better day ahead? Technically speaking, getting better organized is not that difficult. What makes getting organized challenging for some people is changing their internal dialogue – the way they speak to themselves inside their mind about what they want to get done – and installing new, positive little habits into their day. But, actual productivity habits themselves are pretty simple. Have you ever had a day similar to this, when you get an enormous amount accomplished before 11:00am? …and it’s not even lunchtime yet! However, you’ve probably also had days, when you look up at the clock, and it’s 11am, and all you’ve accomplished is to check your email. This sort of thing happens a lot, and it’s an example of the kind of difference that being truly organized makes. When you have your systems in place – you have a plan for the day and a way to stay on track when potential distractions present themselves – you can flow through your day accomplishing one task after the other, and it feels fantastic. As you might already know, I’m pretty fascinated by the topic of self-efficiency (which, of course, goes hand-in-hand with being organized). To me, it’s like a fun game – to see how much I can get done during a typical day if I’m really organized. The pay-off to this game is pretty big: the more organized you are, the more free time you will have left over for relaxation and recreation – to spend quality time with your friends, family and children, and also to engage in those activities that you enjoy and feel passionately about. 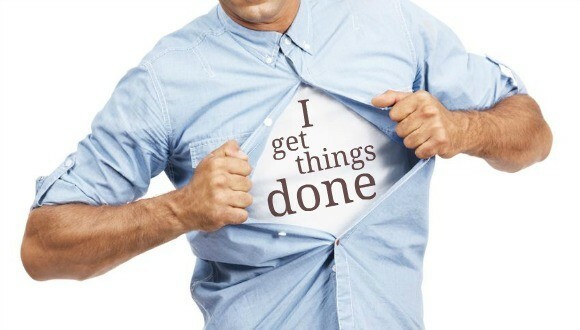 The bullet point that I least agree with is “procrastination can be good,” because I do believe that, every now and then, it’s best to take that one thing from your task list that has been there the longest, and just gut-it-out and get-it-done. Dane Findley at his standing workstation. But perhaps Stillman meant that it’s better to procrastinate a task than to burn yourself out – which I agree with. And I think Stillman also means, that – like it or not – sometimes you have to procrastinate some tasks because higher-prioritized tasks will be the focus of the day. Which is true. The big, ultimate point here is this: it’s very hard to be awesome at anything if you just “wing it” each day. When it comes to improving your own personal productivity, you simply can’t do what mostly everyone else does, which is to “react” to their day. You have to be organized. Do not swim with the other reactive-fishies! To be a get-it-done person, you’ve got to swim in a different direction from that of our current culture. Please believe me when I tell you: it’s in your best interests to, periodically, look objectively and consciously at how you spend your time habitually each day. I mean, really look at it. Evaluate, and determine where you can make small improvements. Then, play around with different efficiency systems until you find ones that work particularly well for you. Feel accomplished! When done optimally, checklists are more fun than you think. Subscribe now to our weekly updates and as a BONUS you'll receive the report "How to Get Outrageously Organized Using Checklists." ...free, for a limited time. Should Your To-Do List Be on Paper or Digital? Where is your to-do list right now? Is it in your car? Is it on your desk? Is it in your phone? It’s a good idea to keep a current list of tasks you’d like to get done. Even just compiling such a list has value because it clarifies your thoughts, helps bring your day and week into better focus, and empties the repetitive, worrying contents of your mind into a more organized place. Whether or not you should keep your list on paper or in digital form, depends primarily on how mobile you are throughout the day. If you have one primary workstation where you’re at most of the day, then paper might make more sense – but if you move around a lot throughout the day then you might want to consider a digitized list. It’s really just a matter of personal preference – there’s no right or wrong. Me, I use both. I have a paper-and-clipboard system that I use for my quotidian and for my once-a-week lists, but my work-related to-do list and calendar are digital. One of the reasons that I digitally track my professional projects and tasks is because it makes collaboration easier. Here’s a simple web-based application that I use to get organized and stay on track. There are many fantastic and free apps available for list-making. As I mentioned above, some people like to keep their to do lists on pen-and-paper, others digitally, and still others – like me – do both. In this video below, I show you – briefly and simply – how I use a browser-based application called to improve my self-efficiency. I used to use Backpack; at the moment I’m using Asana. As I mention in the video below, you can use a list-making app not only to put your own personal productivity on steroids, but also to vastly improve how you collaborate with your team – be they colleagues or family. Another benefit to using a good browser-based list app, is the ability for sliding tasks up or down in your digital to do list. It sounds like a little thing, I know, but – believe me – it makes a huge difference. As a general rule, though, when it comes to productivity applications, I do not believe in gimmicky features that might distract the user and clutter the design. Simplicity, for the win! Someone who I greatly respect said recently, “the trick to being happy in modern life is: simplicity.” And so it is with personal productivity systems. The best systems are often the most simple. A good checklist system can help you to make the most of each day, and to enjoy each day more as you move steadily toward your goals. If you aren’t currently using an excellent personal productivity system, then I encourage you to ask around and find a great one. If you don’t keep a to-do list, or if you’ve tried keeping to do lists in the past but have since fallen off the wagon, I’d like to encourage you to try again. Once you find a system that works for you, it really, truly makes a difference in terms of getting things done. be more professionally competitive and get more done in a day than other professionals do, on average. by getting more done in less time at your optimized workstation, it will create more free time that you can then use to spend with your loved ones, or doing good-for-you stuff… like exercising! engages a procedural system of personal productivity (whether on paper, or digitally).